Can you picture it? A vegan world? When will it come? A lot of people ask me this when they find out that I am vegan. “How will you convince everyone to give up meat? Now I know what you’re thinking. You’re probably thinking that’s kind of obvious, and you’re probably thinking I mean increase the awareness over the animal rights, environmental and health disaster that is animal agriculture. And while I do think all three of those things are incredibly important to educate people about, that’s not what I mean. Maybe I’ll put it differently: make alternatives the appealing choice. Yes, I’m talking about fake meat. Here’s the deal — meat from animals is inefficient. You pretty much can’t argue this. It’s just physics. It’s ecology. Eating higher on the food chain is inherently inefficient. Eating lower on the food chain will always be more efficient. Why? Because things higher on the food chain require more inputs (water, food, fertilizer, antiobiotics, etc). Those inputs cost money and resources and are thusly inefficient. Plants are lower on the food chain and are more efficient, both from a resource perspective and a cost perspective. So alternatives (yes, I mean fake meat) outperform meat from animals in cost and environmental efficiency. They also obviously outperform meat from animals from an ethical standpoint. No dead cows means a more ethical burger. Then there’s this: a vegan burger just won Best Burger in the World. Note: that didn’t say “Best Veggie Burger in the World.” Meat burgers were in the running, but one made from plants won the day. So if plants can be cheaper, better for the environment, more humane, more nutritious and tastier??? We may not have to convince anyone to go vegan, we merely have to continue to work to make alternatives win in all these categories. If it’s cheaper and tastes just as good, this will be the end of meat and no one will miss it. For more meat-free products check out Gardein, Beyond Meat, Tofurky, and many others. If you live in the Minneapolis area you can check out the world’s first Vegan Butcher for artisanal vegan meats and cheeses at The Herbivorous Butcher. A week or two ago I saw a meme on Facebook. Ok I see lots of memes on Facebook, and to be honest, most are pretty meaningless. But this one was a quote from the Dalai Lama. He’s a pretty wise man, so I tend to listen to what he has to say. This meme succinctly describes the hypocrisy of how many modern humans conduct their lives. I’m not here to point any fingers or blame anyone for this imbalance. I merely want to shine a light on it, and suggest that we’ve got it all wrong. I want to make the plea for health. We tend to sacrifice a lot of ourselves in the pursuit of attaining more – more money, more status, more clothing, more possessions, etc. We tend to, as a culture, be over-worked and over-stressed in these pursuits. We, as the quote suggests, sacrifice our health in the pursuit of wealth, only to, as we get older, use that wealth to try to buy back some health. As I said, we’ve got this all wrong, and I can prove it. Bear with me for a second here, I am going to get just a bit existential. The future does not exist. It’s not real. That may or may not sound controversial to you. But it’s hard to argue with. We can reasonably predict that some future will take place in some way. Things have continued for however many years we’ve already lived, and with a little luck, we can reasonably assume that we will continue to exist in a relatively similar fashion. But we have little actual impact on that future. The amount that we control in that future is very very small. This isn’t to say that we should not work hard or save money. For many life goals, money is essential. But while the future is and always will be a fantasy, an idea, there is something real that you are experiencing right now. The present moment is real, it is tangible. You are experiencing it right now, and believe it or not, it’s all you actually have. Even when the future comes you will experience it in the present moment. And while a lot of people think that investing in your health is solely for the purposes of attaining more future (increasing the amount of years you have on the planet), the real benefit of health is experienced in the NOW. This is the only time when you can experience anything! That, and because health is a present state of being. I am not a healthy 80-year old. I am a healthy 29-year old, and as such I am fit, in shape, and eat a diet that gives me abundant energy in the moment. It makes me feel good today, not 50 years from now! If I am fortunate the choices I make today can lead to a better reality for myself in 50 years. But that is simply a fantasy, an illusion. Not entirely unimportant to consider, but not where the real benefit of a healthy lifestyle is conferred. Look, money, hard work, promotions – these are good things for which to strive. But do not sacrifice your health in their pursuit, because this is a truly foolish trade. You trade your wellbeing now (the only time you can experience wellbeing) for potential future wellbeing. Once this future is achieved, you need to trade back the money you got for the health you gave up in the form of expensive drugs and surgeries. Invest in your health TODAY, in THIS MOMENT. It is far more valuable than any sum of money you could possibly dream of. If you follow current health trends online — subscribe to a blog, follow a nutrition “expert” on social media, etc — you may feel like there is a ridiculous amount of conflicting evidence pointing one way or another on diet advice. There’s the classic divide between paleo and vegan, but then there’s low-carb, low-fat, high-fat, Zone, South Beach, etc. There’s a lot to be confused about. The reality is there is far more consensus on what we should be eating than you probably realize. Why might you not know this? The next study showing a previously heralded food is bad for you will be music to the ears of book publishers. They can’t wait to sell you the next greatest thing in to the diet crazed public. Don’t buy the hype. Literally. Save your money. Healthy eating is simple, and a few weeks ago leaders from all walks of nutrition, paleo advocates and vegan plant-based advocates alike, all met to discuss common ground. Nothing too inflammatory there. Honestly nothing that would make for a New York Times Bestseller. And that’s how you know it’s true. All leading experts agree — paleos and vegans — that our diets need to be centered around whole plant foods and not animal or processed foods! It’s really that simple. If you’d like to read more about this meeting of the minds, as well as see who was on the panel, check out the write up by Forks Over Knives. Last night a friend came to town for the holidays. He happens to be a fan of the blog, and has recently gone vegan! So it was extra fun to see him now that we share the same diet, and to commemorate this, we decided to cook a healthy vegan meal at his parents’ house. See, being Midwestern folk, they were pretty worried about what to feed their son while he was home, now that he was a crazy vegan. In fact, they were very worried. So we decided to take the reigns and show off what healthy plant-based vegan cooking can look like! His mother had bought some black bean spaghetti, and though neither of us had ever had it, we decided to go for it. We roasted up some butternut squash, red onions, and garlic, and tossed it with the pasta and some balsamic vinegar. We also whipped up an awesome spinach salad, and my friend made these bell pepper and avocado “bites” that were super delicious! As we dined we discussed healthy eating and why I was a vegan. And I shared the main reasons that sparked the change, including that animal agriculture is the number one cause of climate change. And sometimes you forget — this stuff is not well known. This was the first his parents had ever heard that, and they were stunned. Yet they also were quick to understand why. If you look at it, it’s pretty easy to see how industrialized animal agriculture is an incredibly wasteful system, and how eating plants directly is much more efficient. We also talked about the health benefits, and I shared my mother’s now 40+ pounds of weight loss after going vegan and my 20+ pounds! My friend even had a 10-15 pound weight loss story of his own from going vegan. Did we convert both of his parents into vegans? Of course not. That’s not how it happens. And that’s ok. This is gradual. They both did say they were going to try to eat more vegan meals, and that is a start. A darn good start! As I shared in a recent video, Meatless Monday’s are almost solely responsible for 800 million fewer animals being raised and slaughtered in the US annually since 2007. Sometimes vegans see the outrageous industry that is animal agriculture and they want to scream at people until they are blue in the face and the person is forced into veganism. But that’s not how it works. Happy Holidays from Plantiful Health! Why do we eat meat if its so bad for you? Isn’t it natural to eat meat? Our ancestors all did! 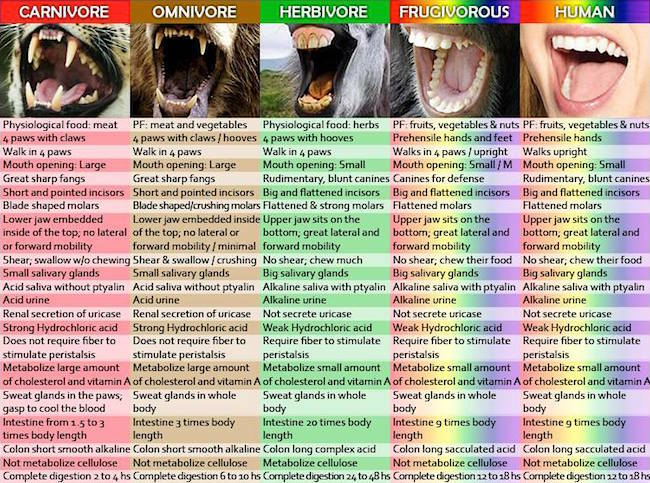 Humans are omnivores! We have canines!